I am an audiophile living in South Korea. I have an audience 1 + 1 v2 + speaker. I purchased this speaker as a desktop speaker. The performance of this speaker was so amazing that I get goose bumps and thrilled in my head. I received a sense of delight from this speaker. I enjoy listening to music through this speaker every day. I am so happy to find a desktop speaker for me to be with forever. So I thought I should express my gratitude to you. Thank you for the hard work of the Audience staff. It’s just amazing. 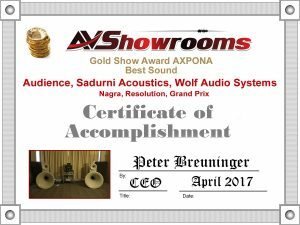 Audience is pleased to announce that it was awarded by AV Showrooms to be one of the top ten best sounding rooms at AXPONA 2017. San Marcos, CA, March 13, 2017 – Audience announced the introduction of its Au24 SX powerChord, Au24 SE-i power Chord and powerChord SE-i, three ultimate-quality AC power cords that incorporate the company’s latest materials and engineering advancements to enable extraordinary levels of sonic improvement in high-performance audio systems. The all-new top of the line Au24 SX powerChord represents the culmination of 20 years of Audience’s experience in high-end power cord design. It is created to be nothing less than the ultimate AC power cord. Audience president John McDonald and the late Audience engineer Roger Sheker spent a full year developing and testing various configurations of this wire until determining its final configuration. Each of the power cord’s two ground wires is separately shielded and hand-wrapped with Teflon. The Au24 SX is insulated with the highest-quality XLPE (cross-linked polyethylene) dielectric material available. The Au24 SX is terminated with the Furutech Pure Transmission Fi-50M NCF Piezo Ceramic AC connector, chosen for its sonic superiority and exceptional build quality. The Au24 SE-I powerChord is an evolution of the award-winning Au 24 and Au24 SE powerChords. It has been upgraded with Audience’s all-new, proprietary power cord connectors, which provide a more refined and smoother musical presentation. All previous Audience Au24 SE and Au24 powerChords can be upgraded to the latest Au24 SE-i version. Audience’s new powerChord SE-i is an improved version of the time-proven standard powerChord. Its six-conductor geometry has been reconfigured, resulting in a much more spacious sonic presentation with greater solidity of vocals and instruments on a wider and deeper soundstage. All three new powerChords are designed to eliminate or reduce the traditional weak points of conventional power cords: more often than not, power cords will behave in a reactive manner and introduce capacitance, inductance and resistance into the electron flow, which will compromise the interface between the component and the power source. The Au24 SX, Au24 SE-i and SE-I feature a high-current, low impedance, wide bandwidth design for fast response, accurate reproduction of macro and micro dynamics, articulate bass, superior imaging, exceptional harmonic integrity, lower background noise and additional sonic benefits. The new Audience Au24 SX powerChord, Au24 SE-i powerChord and powerChord SE-i AC power cords are currently available. The 6-foot Au24 SX 10 AWG powerChord carries a suggested retail price of $4,600, +/- $180 per foot. If purchased as an option with any Audience Adept Response power conditioner (in place of the standard powerChord SE-i usually supplied), the optional upgrade price is $4,200. The Au24 SX MP 13 AWG medium-power version powerChord (for use in audio components that require up to 150 watts of power) is available at $3,500 suggested retail for a 6-foot power cord, +/- $150 per foot. A 6-foot Au24 SE-i powerChord has a suggested retail price of $2,560, +/- $150 per foot. The powerChord SE-I is available at $915 suggested retail for a 6-foot length, +/- $30 per foot. All previous Audience powerChords can be upgraded to any of the latest versions.